In part 1 of The Fuzz I showed you guys three of the Fuzz Squad (Gobie, Anchovy & Barracuda). This post is just about Dandy. Dandy is a special guy. I've had him in my home since he was 4 weeks but he's been in my care since he was about a week old. He came into the veterinary hospital I worked at and into our kitten rescue program. Unfortunately the girl who was bottle feeding them tried to wean the litter far too early and I received a phone call asking me to come look at the kittens. When I got there this little guy was on the edge of death. His head was just rolling around on his little body, his color was bad and while I was holding him he stopped breathing - twice. 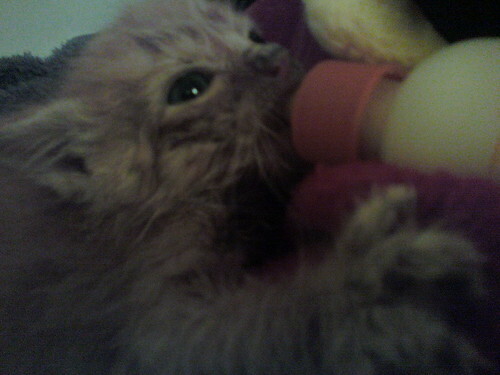 After two rounds of CPR and a good warm bottle he perked up and I took him into my care to foster at home. Watching him grow from a near-dead 5 ounce fluff ball into the 9 pound beast of love that he has become is one of my great joys in life. 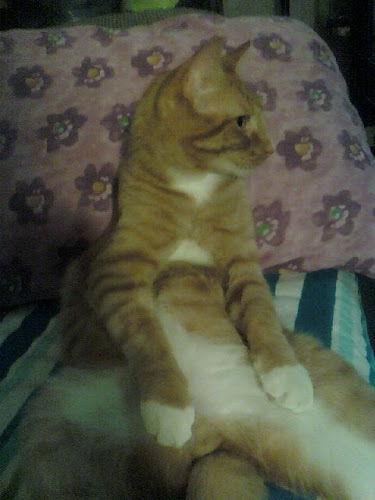 When people ask me why 6 cats - Dandy is the epitome of why. All of my little Fuzz Squad have a similar story and I can't imagine my life without them.